License terms for using the Starter User Manual Template for creating technical documentation. IF YOU DO NOT AGREE TO THE TERMS OF THIS EULA, DO NOT INSTALL, COPY, OR USE THE PRODUCT. BY INSTALLING, COPYING OR USING THE PRODUCT, YOU ACKNOWLEDGE THAT YOU HAVE READ THIS EULA, UNDERSTAND IT, AND AGREE TO BE BOUND BY ITS TERMS AND CONDITIONS. (a) You must not copy the PRODUCT or parts of the PRODUCT except for installation in accordance with this EULA, and except for backup. (c) You use the PRODUCT at your own risk. To use the PRODUCT, you may need software from third parties, which is not supplied by indoition publishing and not covered by this EULA. You agree to provide and use these third-party products at your own costs and at your own risk. The PRODUCT is licensed, not sold. You obtain a limited license to use the PRODUCT. indoition publishing and its suppliers retain all right, title and interest, including all copyright and intellectual property rights, in and to, the PRODUCT, and all copies thereof. All rights not specifically granted in this EULA, including copyrights, are reserved by indoition publishing and its suppliers. For full versions and free editions, the license is non-exclusive and temporally unrestricted. For trial version, the license is non-exclusive and ends with the end of the trial period. One copy of the PRODUCT may either be used by a single person who uses the PRODUCT personally on one or more computers, or installed on a single workstation used non-simultaneously by multiple persons, but not both. You may access the PRODUCT through a network, provided that you have obtained individual licenses for the PRODUCT covering all workstations that will access the PRODUCT through the network. The PRODUCT is licensed as a single product. Its component parts may not be separated for use on more than one computer, or accessed in any way other than through the provided user interface. “Education Versions” and “Not for Redistribution (NFR) Versions” may not be used for, or distributed to any party for, any commercial purpose, notwithstanding other sections of this EULA. If the PRODUCT supports multiple platforms or languages, if you have received the PRODUCT on multiple media, if you otherwise have received multiple copies of the PRODUCT, or if you have received the PRODUCT bundled with another PRODUCT, the total number of your computers on which all versions of the PRODUCT are installed may not exceed the number of valid licenses that you have purchased. You may not rent, lease, sublicense, lend or transfer any versions or copies that you do not use. You may not duplicate the PRODUCT, provided that the duplication is not necessary for the normal operation of the PRODUCT. Duplication is considered necessary when it occurs during the installation of the PRODUCT to a hard disk from the accompanying media and when downloading or printing out data from the PRODUCT for exclusively personal use. You may create a backup copy when such action is necessary to ensure future use of the PRODUCT in the contractually implied, exclusively personal manner. You may not transfer the rights to a backup copy unless you transfer all rights in the PRODUCT. You may not transfer, rent, lease, lend, sublicense, copy, modify, sublicense, time-share or electronically transmit the PRODUCT, any parts of the PRODUCT, or any content given within the PRODUCT, media or documentation. This also applies to any and all intermediate files, and source code. You must not use the PRODUCT for developing any product or service that has the same primary function as the PRODUCT. You may not use the PRODUCT’s source code or any images and media supplied with the PRODUCT to produce your own documents or products. This restriction does not apply to any templates that are expressly marked as a template for use with your own projects. You may only use the PRODUCT within a training course, workshop, or other public or private presentation or other event if you have purchased a valid license for each participant. You may not remove or obscure any copy protection system, copyright notice, or registration number built into the PRODUCT, or any other characteristics that serve to identify the PRODUCT. You may make derivative works of the PRODUCT, including translations, only for personal purposes or for internal use within your organization. You must not sell or publish any of your derivative works in any way. If you make available your derivative work to any other person within your organization, you must first acquire an additional license for the PRODUCT for each person who is granted access to your derivative work. Also you must include this EULA, and each user of your derivative work must accept this EULA before using the PRODUCT or your derivative work. Exception: If your PRODUCT is the indoition Starter Template, you are allowed to adapt this template and to make available the adapted version to other persons within your organization free of charge. However, you are not allowed to make available any derivative templates to persons outside of your organization, regardless of whether you charge any money for these templates. Also, you are allowed to create and to distribute any number of user manuals from the original template or from any adapted version of the template free of charge. indoition publishing may offer site licenses which allow unlimited use of the PRODUCT by all employees of an organization. (a) Single Site License: The PRODUCT may be distributed, installed and used by all employees of the licensed organization whose primary place of work is the nominated site. A site is defined as one place of business for the organization, and must be specified on the license. (b) National Site License: The PRODUCT may be distributed, installed and used by all employees of the licensed organization whose primary place of work is within a nominated country. (c) International Site License: The PRODUCT may be distributed, installed and used by all employees of the licensed organization worldwide. The following restrictions apply to all site licenses: Subsidiaries, parent companies, brother/sister companies, affiliates and/or agents are not considered to be the same legal entity and are therefore not entitled to have the software installed on their computers. If any of the computers on which the PRODUCT is installed has been leased, borrowed, or sold, the PRODUCT must be completely removed prior to the computer being returned to its owner or turned over to its new owner. You are allowed to sell or transfer this license on a permanent basis, provided that the initial user does not retain any copies. The number of transfers is limited to one transfer per license per calendar year. If the PRODUCT is an update, any transfer must include the update, as well as all earlier versions. The license is effective until terminated. You may terminate the license at any time by destroying the PRODUCT together with all copies thereof. The license will also terminate immediately without notice from indoition publishing if you fail to comply with any term or condition of this EULA. Upon such termination, you agree to immediately destroy all copies of the PRODUCT. All other rights of both parties and all other provisions of this EULA survive any such termination. Updates and upgrades are treated identically. All provisions that affect updates affect upgrades in the same way. Updates are provided to you on a license exchange basis. You agree by your installation and use of such copy of the PRODUCT to voluntarily terminate your earlier EULA and that you will not continue to use the earlier version of the PRODUCT or transfer it to another person or entity. However, you may continue to use the previous version of the PRODUCT on your computer after you receive the update to assist you in the transition to the update, provided that: (a) the update and the previous version are installed on the same computer (b) the previous version or copies thereof are not transferred to another party or computer unless all copies of the update are also transferred to such party or computer (c) you acknowledge that any obligation that indoition publishing may have to support the previous version of the PRODUCT may be ended upon availability of the update. If the PRODUCT is an update from another product, you may use or transfer the PRODUCT only in conjunction with that updated product, unless you destroy the updated product. If the PRODUCT is an update of a component of a package of PRODUCTS that you licensed as a single product, the PRODUCT may be used and transferred only as part of that single product package and may not be separated for use on more than one computer. Except with respect to any sample application code, “Trial Version” and “Not For Resale (NFR) Version” of the PRODUCT, indoition publishing warrants that the PRODUCT will perform substantially on a typical computer system that meets all system requirements, and that the physical media on which the PRODUCT is furnished, if provided by indoition publishing, will be free from defects in materials and workmanship under normal use. 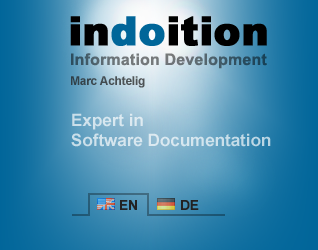 indoition publishing does not warrant that the PRODUCT works free of errors on any particular computer system of the user. You understand and agree that due to the different configurations of computers, web servers, PHP installations, wikis, content management systems, scripts, plus other components and plug-ins, indoition publishing cannot provide an out-of-the-box solution that works in all cases without any adaptation. You agree to make such adaptations at your own costs and at your own risk. There is no other warranty, expressed or implied, including the warranties of merchantability and fitness for a particular purpose, and noninfringement with respect to the PRODUCT and the accompanying documentation. indoition publishing does not warrant that the PRODUCT will meet your requirements, expressed or implied, or that the PRODUCT’s operation will be free of errors, free from interruptions, and free from other failures. The PRODUCT is not fault-tolerant and is not designed, intended or licensed for use in hazardous environments requiring fail-safe performance, including without limitation, the design, construction, maintenance or operation of nuclear facilities, aircraft navigation or communication systems, air traffic control, and life support or weapons systems. indoition publishing specifically disclaims any express or implied warranty of fitness for such purposes. The PRODUCT does not provide any legal advice. Before shipping your own products and documents that were made by using the PRODUCT, you are fully responsible for making sure that you follow all relevant standards, laws, and other regulations that are applicable for both your own country and for all countries to which you ship and sell your products. All rules that are given in these standards, laws, and other regulations take precedence over any suggestions made by the PRODUCT. Some jurisdictions do not allow limitations on implied warranties, so the above limitation may not apply to you. The foregoing provisions shall be enforceable to the maximum extent permitted by applicable law. The PRODUCT is provided “as is”. To the maximum extent permitted by applicable law, in no event shall indoition publishing and its suppliers be liable for any damages whatsoever (including, without limitation, damages for loss of business profit, business interruption, loss of business information, loss of data, or any other pecuniary loss) arising out of the use of, or inability to use, the PRODUCT, even if indoition publishing has been advised of the possibility of such damages. In no case shall indoition publishing’s liability exceed the purchase price for the PRODUCT. In particular, you understand and agree that scripts that are used or suggested within the PRODUCT might interfere with other programs and might trigger actions that result in unwanted change or loss of data. You assume all responsibility for the selection of the PRODUCT as appropriate to achieve the results you intend and for the installation of, use of, and results obtained from the PRODUCT. indoition publishing has not done research into whether any components or materials within the PRODUCT constitute infringement of any current or future rights. indoition publishing has no knowledge of, and accepts no liability for, any such infringements. indoition publishing’s and its suppliers’ entire liability and your exclusive remedy shall be, at indoition publishing’s option, either (a) return of the price paid or (b) repair or replacement of the PRODUCT that does not meet indoition publishing’s limited warranty and which is returned to indoition publishing with a copy of your receipt or proof of purchase. All warranties are void if failure of the PRODUCT has resulted from accident, abuse, or misapplication. Support is exclusively provided by e-mail. Queries regarding the installation and use of the PRODUCT must be submitted to support@indoition.com. indoition publishing does not provide any support for customizing the PRODUCT or parts of the PRODUCT, and for making derivative works of the PRODUCT. All scripts, format definitions, and sample source code provided with the PRODUCT are provided “as is”. indoition publishing does not provide any support for your particular authoring tool. Even if you use the indoition Starter Template, the template can't eliminate any incorrect output that your authoring tool may produce. If you need assistance with formatting your documents, you need to consult your authoring tool's documentation or get help from the support of your authoring tool’s vendor or manufacturer. Support for the PRODUCT only covers questions regarding the standard installation on a local file system. Due to the different configurations of web servers, PHP installations, wikis, content management systems, scripts, plus other components and plug-ins, indoition publishing cannot provide support for all systems and system components that may be in use. Support for the PRODUCT does not cover any questions about the content delivered by the PRODUCT. If you need any general consulting or training on technical writing, programming, or design, you need to agree on a separate support or consulting contract. Rates and conditions are available from sales at sales@indoition.com. indoition publishing does not provide any legal advice. You are solely responsible for the payment of all taxes, duties, or levies that may now or hereafter be imposed by any authority upon this EULA for the supply, use, or maintenance of the PRODUCT, and if any of the foregoing taxes, duties, or levies are paid at any time by indoition publishing, you shall reimburse indoition publishing in full upon demand. This EULA constitutes the entire agreement between the parties for the supply and use of the PRODUCT and its associated documentation and components. This EULA supersedes all prior arrangements, agreements, representations, and undertakings. This EULA may not be changed or modified except by a written instrument duly executed by each of the parties hereto. You shall have no right to sub-license any of the rights of this agreement, for any reason. The failure or delay of indoition publishing to exercise any of its rights under this EULA or upon any breach of this EULA shall not be deemed a waiver of those rights or of the breach. indoition publishing reserves the right at any time to cease the support of the PRODUCT and to alter prices, features, specifications, capabilities, functions, licensing terms, release dates, general availability or other characteristics of the PRODUCT. This EULA is governed by and construed in accordance with the laws of the Federal Republic of Germany. Any dispute with respect to this EULA or in connection with the performance or termination thereof will be brought before the applicable courts in Nürnberg, Germany, exclusively. If any provision if this EULA are held illegal, invalid or unenforceable, in whole or in part, such provision shall be modified to the minimum extent necessary to make it legal, valid and enforceable, and the legality, validity and enforceability of all other provisions of this EULA shall not be affected.